Guniting is a process of repairing concrete work, which has been damaged due to any other reason. Guniting Machine plays a major role in completing the task. Meta Therm Furnace Pvt. Ltd is counted among the leading Guniting Machine Manufacturers in Mumbai. Our products have great recognition in the market for their easy interface and advanced features. Our products have the quality that gives you value for your investment. Our Gunite Machine consists of a twin chamber gun and a water tank, powered by Air motor. Easy to use and recover all the cracks and damages. Can be used for sandblasting by fitting a nozzle at one end. Low running costs and require less maintenance. Their sturdy construction prevents any damage and ensures a long serving life. Named among the preeminent Pneumatic Guniting Machines Exporters and Suppliers In India, we won’t let our clients dissatisfied with the quality of our products and after-sale support that we serve. 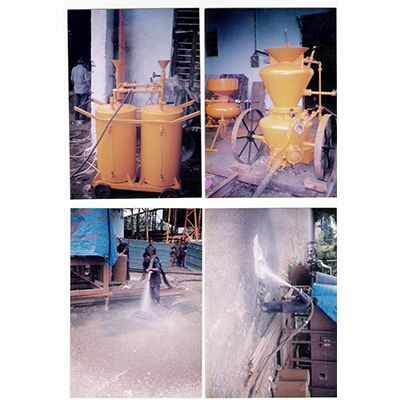 You can buy our Concrete Guniting Machine at the industry leading prices, directly from the website.